Since I began working with SketchUp, I have been a huge fan. In fact, I think this tool is one of the most important tools a woodworker can have in his arsenal. It is well worth taking the time to learn this program frontwards and backwards. You can pull apart a drawing to see how it’s assembled. 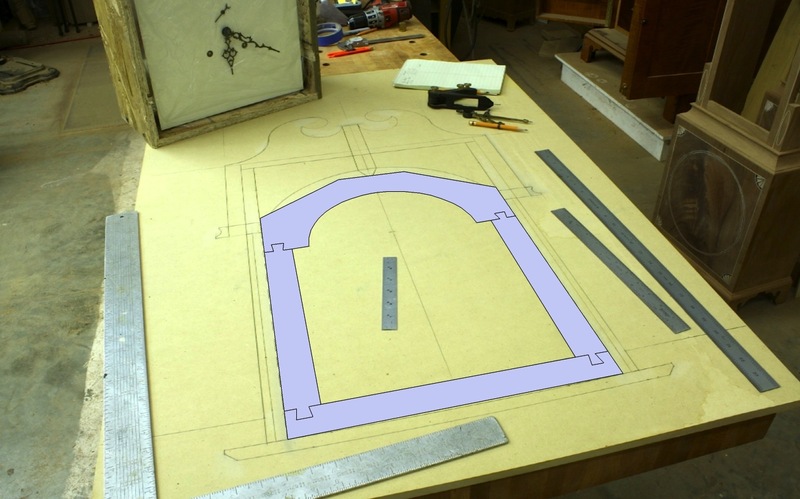 Or if you’re drawing the project, you can discover problem areas and work out the details to keep from wasting time once you get into your shop. There are, however, times when it’s better to draw out your project full-size. 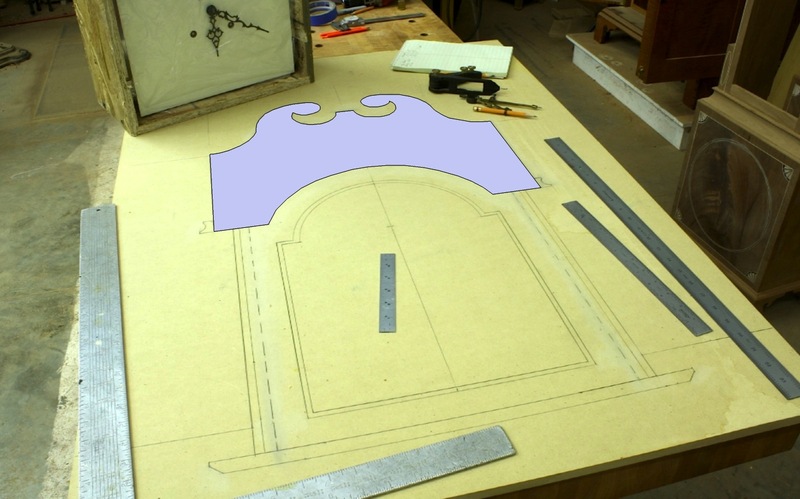 Case in point is the hood for the Egerton tall clock on which I am working. (Yes, I know it’s been a while.) 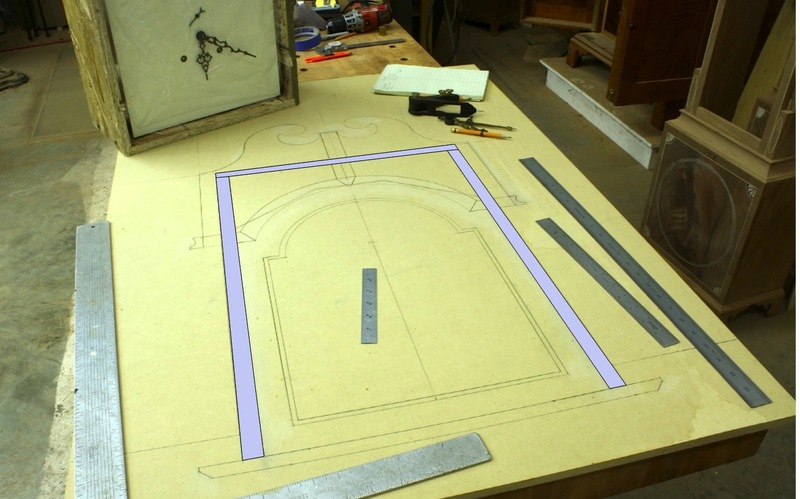 I could have drawn this in SketchUp and printed out the full-scale drawing, but that would require perfect sizing and about 12 sheets of paper to assemble correctly as I taped together the image. What’s interesting about the mask is that it is joined using dovetails and it is attached to the hood frame using glue blocks. 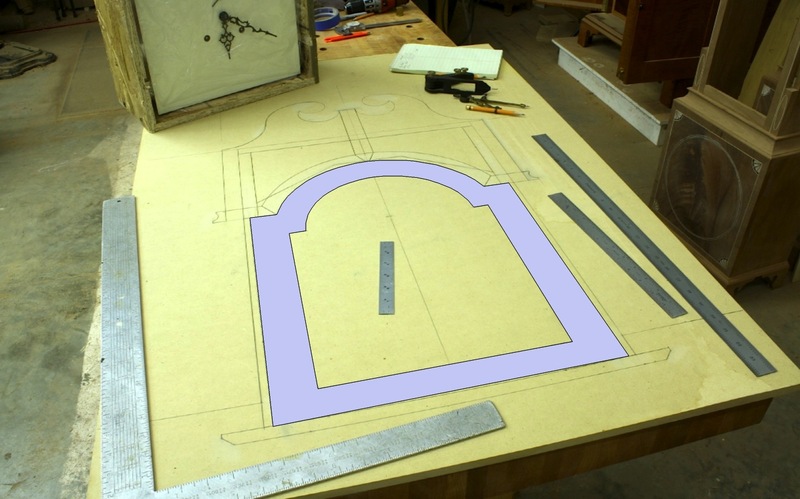 Many masks are joined using half-laps at the bottom and often the top piece is simply butted to the lower frame. And the entire frame is slid into a groove cut in the hood sides. The door frame is slightly wider than the mask – it covers a part of the frame, too. Here you can see the hood frame. The top is joined to the sides using dovetails. Also, there are small widows on both sides that allow owners, back in the day, to show off the expensive brass clockworks. Here’s a look at the scroll board as well as the returns that wrap back the hood sides. This is a place where full-size drawings really help. I have the exact pattern needed to produce my scroll board. As you can see, there is a lot going on in this drawing. And tons of information to extract. Without the drawing I would have spent way more time pulling sizes and working out details. Sometimes, drawings are best. I’m still stuck in my old ways, physically drawing things out. At times I have scanned them to the computer and edited them in Paint Shop. Yesterday I drew out to scale a plan for 4 storm windows that I need to build this spring, it took me about an hour with just a ruler. 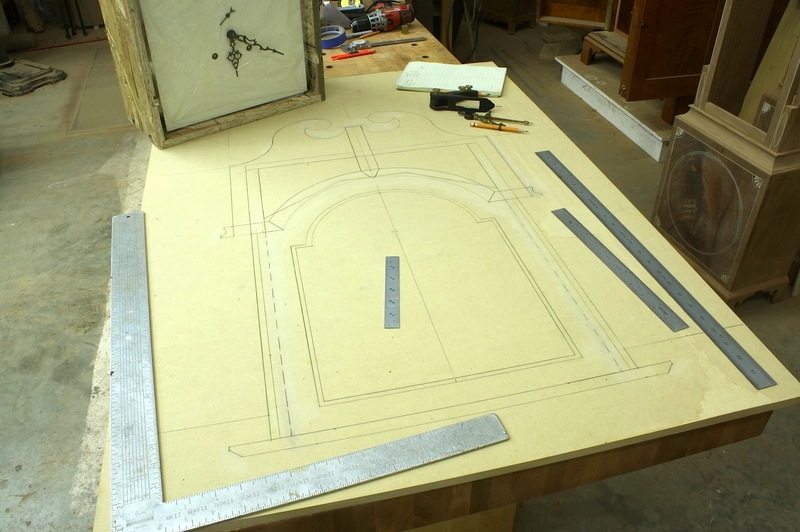 I do have a fairly large antique drafting table and arm for larger projects. I guess that I’m too lazy to take the time to learn computer aided drafting. Maybe someday.